With a duo like Dale Hodges and Reggie Willis one would expect a dynamite show. Throw in a director with a reputation like Mark Lutwak and then find a script that is beloved like DRIVING MISS DAISY and you have an expectation of masterpiece theatre. The thing is as good as DRIVING MISS DAISY is and as good as Hodges and Willis are (and Randy Lee Bailey ain’t half bad either), I walked out of The Carnegie feeling like something was missing. Perhaps it was the audience, filled with unbelievably obnoxious behavior. A woman behind me literally passed gas out of both ends and just said “excuse me” as if this was totally acceptable. The woman next to me arrived at 3:00 exactly, climbed over me during an awkward and timid curtain speech, and shifted in her seat as if we were on a cruise ship. She had so much perfume on I actually thought I was smelling Miss Daisy herself. People talked through scenes, phones were vibrating in their purse, and people were unzipping their purses to get out their bottles of soda all within a few seats of me. People got up and opened the clunky doors in the back of the theater as loudly as possible only to come back in creating as much of a distraction as they left causing. It’s a reminder of why I hated the last matinée I saw here and an obvious sign that I need to attend opening night performances instead. But maybe I was expecting more than I should have. In thinking about the script, there are no big climactic scenes, no dramatic arguments, and no emotional breakdowns. It’s chock full of sweetness, humor, and wonderful relationships but nothing overtly dramatic really happens. It’s a beautiful character study and relationship play. As I sat in the theatre and watched the marvelous transformation of the characters from old to very old, I started to think about my own life. And isn’t that what theatre ought to do? Hodges and Willis have great chemistry together. And I liked Bailey’s work, but he might be too nice of an actor to play the ambitious son with the layers necessary to keep up with Hodges nuance. Lutwak has staged the show in as interesting a way as possible, making use of the big stage despite his small cast. He doesn’t need fancy props to tell his story, but instead he and his team make use of radios, era-specific music, and sound effects to set time and place. The large American flag art at the back of the stage reminds us that this is an American story, too, as our country’s change is parallel to that of Miss Daisy and Hoke’s own journey together. DRIVING MISS DAISY didn’t “wow” me; but I don’t think it was supposed to. It would make for a wonderful night out at the theatre for you and a friend. And while you’re at The Carnegie, check out the powerful artwork located near the concession stand and be sure to say hello to Brenda, one of my favorite Box Office managers in town. 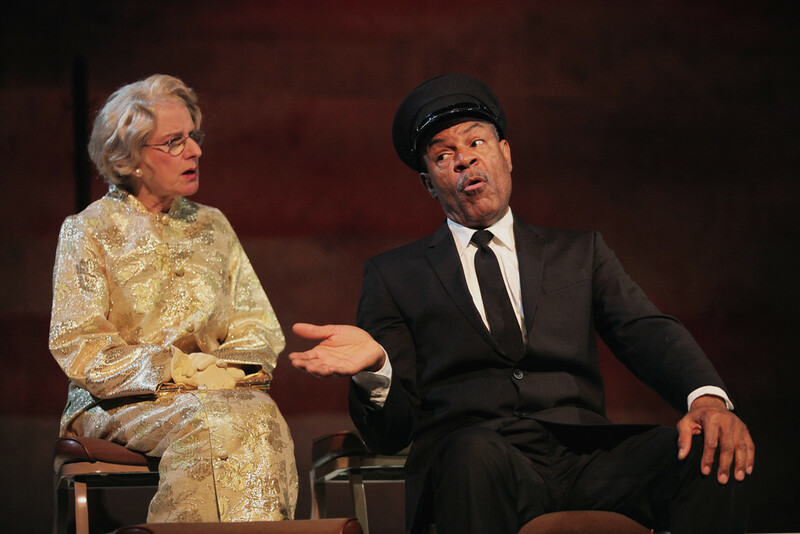 DRIVING MISS DAISY runs at The Carnegie in Covington, KY through November 16th. Tickets and more information are available here or by calling 859.957.1940. The show runs 93 minutes with no intermission. In the interest of dialogue & conversation in our theatre scene, I offer a couple of thoughts back at you. We all will get old and belch and fart in public and hopefully we, too, will be polite enough to say “excuse me.” And hopefully we will remember and understand how to turn off our phones (or whatever we have in 50 years) and have the strength to open and close the doors as our painful bladders force us to rush out and miss the best part of the play (so we have to ask our partner what we missed in a volume load enough for her or him to hear). But that said, mostly in the interest of humor, I do think we need to reconsider what we expect from an audience. Maybe it’s because I do so much theatre for young people these days, but I have come to expect and even welcome a range of behavior from audiences. It’s human to have many many ways to respond to theatre. And we need all those people in our audiences. Perhaps all of us, onstage and off need to let go of a precious sense that theatre must be received in respectful silence. In almost every part of our lives we multi-task or experience things when other things are going on — we drive & listen to the radio; we watch television and drink and talk; we watch movies and eat popcorn. That’s without even considering iphones and laptops and all the other mobile technology. Our dress rehearsal featured an unusually lively and diverse crowd — a rich mix of ages, ethnicities and communities. It was a very loud show; folks commenting on moments and coming & going and also talking back to the actors. Each group informed the other, giving each other permission to find laughter and emotion in every moment of the show. It was a truly remarkable evening in the theatre. because, of course, the audience is 50% of the show. I share this last bit both to underscore my point above, but also to sort of agree with you. There is a problem with matinee crowds — it’s that they are a monoculture. Let’s continue this conversation; is that ok? Of course we can continue to discuss this and any topic! I find this is a larger societal problem though, in that we are willing to accept and tolerate inappropriate behavior for the sake of being inclusionary. I feel like there is a social push to invite people into the theatre (and museums and Music Hall and what not) and I get that. But why we we don’t believe they should be taught how to behave in those institutions, too, as part of their cultural experience confounds me. Decorum and civility are dying in our society and that’s not OK. If I went to a Japanese friend’s home and they asked me to remove my shoes, I wouldn’t bat an eye before following the custom. In fact, I would probably research ahead of time to know what was expected of me and I’d wear appropriate socks out of respect to my host and so I could fit in properly. “When in Rome . . .” and all that. I feel the same way about the theatre. As a guest in a theater, I will follow the cultural norms set forth for me as to not disrupt another guest’s experience. It’s about respect for the rest of the audience, but also respect for the actors and the playwright, too. It’s fascinating to me that I write tons of reviews, features, and columns and most of the time the ones that spark comments are the ones when I call out an audience for its bad behavior. (This isn’t the first time I’ve had these discussions.) Why is what I’ve written controversial? “Driving Miss Daisy” is not “Blue Man Group.” It’s not even theatre for young audiences. (By the way, the curtain speech at Children’s Theatre of Cincinnati AND your own Playhouse Off the Hill shows include instructions for appropriate audience behavior). To fully appreciate a quiet play like this one, I need to be able to engage with the actors on stage and in order to do that I need as few distractions as possible. I need to be able to hear what they’re saying if I’m to fully embrace the moments they are creating on stage. I don’t think its asking too much for people to be respectful as a courtesy for the group as a whole. If I want to engage with the actors in a dialogue, I’ll attend a talk back session where it is appropriate. I respectfully and completely disagree that the audience is 50% of the show. In my humble opinion, an audiences’ role is to observe, react in appropriate ways (set forth again by conventional, common sense behaviors), and then by waiting for their turn to respond through applause and, of course, the now requisite standing ovation (a discussion topic for another day). Obviously if you’ve read much of my writing, you know that I want and need to connect to a piece in an emotional way . . . but if I were to begin uncontrollable sobbing during a performance, I’d be way out of line. (And you’d probably call Mobile Crisis). There’s a way to engage that is not obnoxious and that’s all I’m asking for. Thanks for reading! I adore you and love your work!